LED stadium lights provides the optimal lighting solutions for football fields and stadiums. As a professional LED stadium lights manufacturer, our LED sport light offers a consistent level of lighting ensuring enjoyment and safety for both players and spectators. Our LED stadium lights closely mimic daylight color temperature to make the football, lines, and players clearly visible. Also, All our LED stadium lights is designed with high CRI and TLCI. This will ensure more accurate color rendition. For arena lights, whether for an indoor football arena or outdoor field, you can invest in an LED sport lighting solution from AIS LED. Innovative LED lighting technology is taking over metal halide lamps because LED lighting has proven to be reliable, versatile and energy efficient. Our outdoor LED stadiums lighting can withstand a variety of weather conditions including high winds, rain, and freezing temperatures. Our LED football lights also can perform over long distances from the actual bulbs to the field’s surface. The safety of the athletes is one of our concerns. Our LED sport light make sure that your football field lights are bright enough to avoid injury-causing shadows or glares on the athletic field. AIS designed LED stadium lights to address the varied lighting requirements of stadiums and arenas. Our LED sport light can be used for field lighting, as well as lighting spectator, concession, parking and walkway areas. You can choose from a variety of LED sport lights ranging from 300 to 1,000 watts and from 45,000 to 150,000 lumens. Our LED sports flood lighting can save you up to 85% in energy usage compared to traditional stadium lighting. Most of our LED sport light has a lifespan of over 80,000 hours. This will meet the requirements to replace hard-to-reach bulbs in out-of-the-way locations. Additionally, the reduction in heat generated by LED stadium lighting in indoor venues also reduces the load on air conditioning systems. This will help you to save you even more. Our stadium LED sport light includes round LED stadium lights, LED stadium light replacements and LED sports field lighting retrofits. It’s wise choice to convert traditional stadium lighting into more energy efficient LED outdoor arena lighting, with all LED arena lights containing no mercury. For more information about our LED sports stadium lighting, or to order any of the LED field lighting shown below, just contact us. Our LED lighting experts are waiting to communicate with you. As a leading LED sport light factory, we will advise you on our best outdoor LED arena lights for sale to meet your needs. All our stadium LED arena lights have high CRI and TLCI. The Color Rendering Index (CRI) of our LED stadium lighting is more than 90. Also the Television Lighting Consistency Index (TLCI) is more than 90. This will ensure high color accuracy. We design all our indoor and outdoor LED stadium lighting with Philips 5050 LED chips. This means our stadium LED football lamp has high lumens which is more than 120lm/w. Using our stadium LED football lights will help you and your clients to save more energy and money. You do not have to choose between inefficient incandescents and fluorescents that contain mercury. Our LED sport lighting is safe, environmentally friendly and contains no toxic mercury.Our LED arena lights use 10%-30% energy to traditional lights. As we know,consuming less energy results in fewer greenhouse gas emissions being released into our environment. We use high quality MEANWELL LED driver with our LED sports field lighting which has SPD protection. Also we use innovative cooling technology with copper cooling fins. The heat will transfer easily to the air. This will ensure our LED stadium lighting with 50,000 life span. What is 50,000 hours? If you ran one LED sport lamp for 6 hours per day , it would last for nearly 23 years. Then user will never need to change another light within 23 years. With our professional technical team, we design our LED arena lights with the most attactive appearance. Our LED sports lighting is the most gorgeous lighting that illuminates people and surroundings in color-rich light. Our LED sport lighting are designed to blend seamlessly with any architecture. Also,the proprietary diffusing lens and reflector system delivers an optimal light distribution. Our LED sport lighting comes with a yoke-style bracket. You can position the LED arena lights in almost any angle for many mounting positions. This is the professional LED Stadium Light ranging from 300W-1000W with high CRI and TLCI. The International Commission on Illumination (CIE) defines color rendering as “the effect of an illuminant on the color appearance of objects by conscious or subconscious comparison with their color appearance under a reference illuminant”. To enable a meaningful comparison to be drawn between different artificial light sources the CIE created the Color Rendering Index (CRI) in 1964.The CRI score represents the accuracy with which it will reproduce the full range of colors in a subject . The CRI gives a score for color rendition as it appears to the naked eye and the imaging sensors in television. TLCI is a new method to measure color accuracy. It is short for Television Lighting Consistency Index. TLCI uses software to calculate the color response that would result when using a video camera. High TLCI means accurate color rendition for broadcast television. As you can see, high TLCI and CRI of LED arena lights means accurate Color Rendition. As a leading LED stadium lights factory, we design our LED lights with high CRI (>90) and TLCI (>90). So if you are looking for LED sport light manufacturer,we are the best choice. Surge Protection Devices (SPDs) are protection devices in electrical installation systems . They can prevent excess voltage appearing at the terminals of sensitive equipment. Should an overvoltage event occur, the surge protection device diverts the resulting excess current flow to the earth and therefore protects the electrical appliance. Any electronic equipment can be vulnerable to transient over-voltages, which can be caused by lightning activity or a switching event. This creates a voltage spike increasing the wave’s magnitude to potentially several thousand volts. This could cause instant damage or significantly reduce a piece of equipment’s lifespan. You can find more information about SPD here: What Are SPDs. All our LED arena lights have SPD. This will ensure the safety when use our LED sports lighting. Also the SPD will make sure that our LED sport light can be used more than 50,000 hours. Why you use Copper cooling fins with your LED sport lighting,not aluminum ? We use copper cooling fins as the cooling technology with our LED arena lighting. The will ensure the heat produced by LEDs transfer to the air easily. That’s why our LED sports field lighting has a long lifetime. This is one factor to make us to be a leading LED stadium lights factory in China. What are the requirements for LED Sports Lighting ? The requirements are different according to different arena field. We should consider the factors such as ball size and speed, height off the ground, and arena layout. The LED stadium Lighting must work around speakers, scoreboards, netting and camera platforms. The key to lighting the sports is a well distributed horizontal illuminance to minimize shadows. We can accomplish this by using several lighting fixtures to evenly distribute the lighting in a layered approach. Archery, bowling, skiing, and target shooting are unidirectional ground level sports which require critical vertical illuminance at the target. These sports will typically aim the lighting fixtures at the target while shielding players and spectators alike. The advent of televised sports has changed many illuminance requirements. We need to make sure the camera view is as uniform as possible over the entire playing surface. Typically a sweep aiming technique is used by aiming groups of fixtures from one side to the opposite side of the field so that the vertical illuminance is uniformly distributed. Additionally, larger stadiums increase the distances between players, spectators, and cameras. The resulting lighting requirements are often several times higher than the players themselves need. 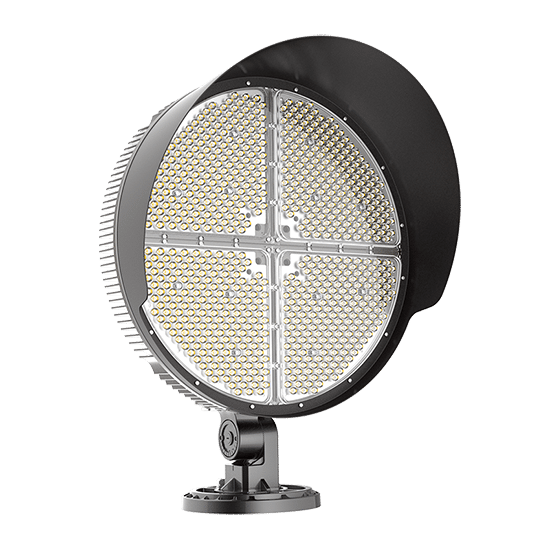 The combination of sweep aiming and increased lighting levels results in a greater initial cost, repeated energy cost, and elevated light trespass offsite. Can we use controller with your LED Sports Lighting ? Yes, you can. You can use owner controls which are remotely programmed and operated off-site. Our LED stadium lights can be short cycled and deeply dimmed without harming the fixtures or creating objectionable flicker. Specialize in the manufacturing of innovative, next-generation LED lighting solutions in Shanghai China since 1998 ! © AIS LED 2019. All rights reserved.